September has almost come to a close, but with the trees just beginning to turn color, it is hard to believe we have fully transitioned to autumn. I hope you have packed in as much outdoor activity as possible this month. Coming off an Achilles injury, I’ve enjoyed getting back on the running trails over the last two weeks, and I have been grateful for lots of great biking weather throughout September. The weather has treated Ann Plans and our clients well this month for our three outdoor events. Most recently, we were part of the Amherst H Wilder Foundation’s inaugural Wilder Block Party on September 17. 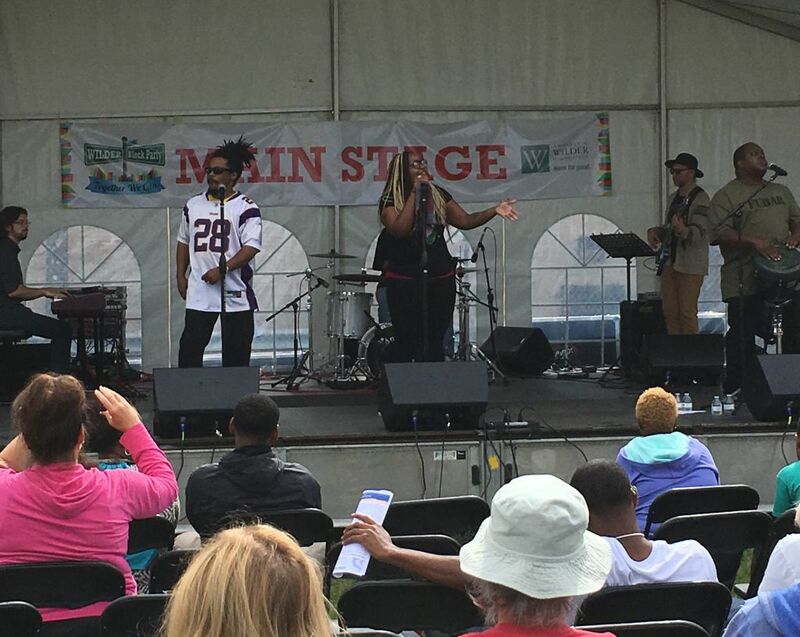 This free community event engaged more than 1,200 people in having fun with music, dance, a community mural painting project, food trucks and more. We had the opportunity to partner with multiple entertainers in the programming for the two entertainment stages which included live music, dancing, juggling, and magic. This month’s newsletter is focused on the fun topic of entertainment. Incorporating entertainment into your event can add energy, contribute to the overall guest experience, and is a way to set your event a part – and keep it fresh. We also believe that decisions about entertainment should be viewed through the lens of your overall event goals. Set the stage with entertainment. Building entertainment into how your guests are welcomed can be a great way to set the stage for a fun and celebratory event experience. At VocalEssence’s Choralia gala this spring, ensemble members greeted guests with song at valet and on the escalators at Radisson Blu. Having a pianist or small combo in your reception space adds to the feeling of welcome and energy – especially for early arrivals. If live music doesn’t work into your budget or reception space, we recommend piping in lively music. Invest your entertainment dollars wisely. You don’t need to spend a lot of money to have impact with entertainment. A single musician, duo or trio can add a lot to the vibe during a reception or an after party. Think carefully about what makes sense for your audience. If your crowd isn’t one that’s likely to stick around to dance at an after party, investing in a large dance band doesn’t make sense. Make a mission connection. Entertainment decisions are a way to be intentional about incorporating mission into all aspects of your event. Jearlyn Steele, emcee and featured performer for Wilder Foundation’s Ordinary Magic event on October 7, has been a great partner in selecting songs and stories that highlight our targeted program messaging. BluPrint, our after party band, is led by Wilder staff member Chazz Reed. Understand audio visual requirements up front. When negotiating fee, clarify whether the talent is bringing their own equipment or if you need to build those audio visual needs into your event order and budget. Mix it up! Varying entertainment from year to year is a great way to keep your guest experience fresh. For the Spirit of the Saints Gala benefiting St. Francis Regional Medical Center and St. Gertrude’s Health and Rehabilitation Center in Shakopee, we have changed up the after party entertainment the past three years. In 2014 we hired a DJ, last year the Black & Whyte Dueling Pianos were featured, and The Covers six member band will perform at the party on October 15. Do your homework. If you haven’t seen a particular entertainer in action, take the time to make sure the individual or group is a good fit for your audience. Check out performance links online if available, attend one of their gigs, and/or arrange an in-person meeting to make sure the chemistry is right. Help your entertainers help you. Entertainers are in the business of generating and cultivating fans. Tag them in your social media posts, and they’ll likely return the favor by sharing your posts and doing their own promoting of their participation at your event. PaviElle performing at the 2016 Wilder Block Party. The Twin Cities is blessed with a wealth of talented musicians and other entertainers. As you are out and about this fall, the Ann Plans team would love to hear of any talent you feel should be on our radar. Happy entertaining!